There is more to a stairway than just steps. The design, individual parts and installation all require the understanding, experience, and knowledge of a master craftsman. Accent Stair and Specialty, a family owned and operated corporation, brings over 30 years of building experience to the stair business. We strive for a quality product with excellent customer service. 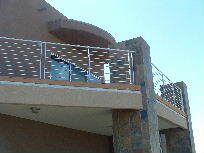 Our goal is to satisfy the needs of any client, from the simplest handrail to the most unique, custom projects. Please take a few minutes to browse through our website to learn more about our company and the services we provide. If you have any questions or would like a commitment-free estimate, please call and let our knowledgeable staff assist you with your project from design to finish. We look forward to working with you.